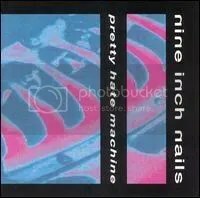 While I think the “industrial metal” tag is deserved for NIN (though Reznor disagrees) we both agree on this one thing– Pretty Hate Machine is NOT industrial metal, though you *can* hear the influence. In Reznor’s own words, PHM is “synth-pop” and I agree whole heartedly with that description. Very dark synth-pop. So how the heck did it end up in MY collection? Well, I had a friend who was big into the band at the time and convinced me to pick up one of their albums. I think I may have gone with PHM only because it was cheaper than Downward Spiral ( :) ). In my opinion, PHM is Reznor’s best. The rest of his output is just too much of the same, angry or shock for the sake of shock. This was real angst here and the overall feel of the album is something that ties very closely to how my pathetic little teenage mind was feeling at the time I picked this up. But I’m a much happier person now and I can just kick back and enjoy this for the great work that it is. Apparently, this TVT version went out of print in 1997 thanks to a dispute with Reznor. Guess I got lucky in ’98 when I found it at a Wal-Mart, of all places. It has since been re-released by Rykodisc.